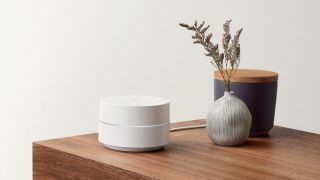 It appears that Google Wifi is still facing teething problems, with customers taking to Google’s online product forums to complain that their routers are repeatedly losing connectivity. The problem seems to be stemming from a router software update that was rolled out last month, with users reporting that after they install the update their router loses its connection and the status light turns a solid blue. Most users have fallen back on the reliable standby of turning their router on and off again, but while they’ve found that this restores their network connection, it drops out again after just a few hours. Even those who've tried a hard reset, and deleted all of their data, haven’t had any lasting joy. Google’s Wifi Care Team has been looking into the issue after it was first reported a few weeks ago, but has yet to find a “final fix” for the problem. In the meantime, Google is suggesting two temporary fixes that have worked for some, but not all, customers. The first fix suggests setting up Google Wifi from scratch, using another user account, while the second suggests disconnecting all wirelessly connected Windows 10 and Xbox devices and connecting them via Ethernet instead. Fortunately for Google the issue appears to only be affecting a relatively small number of Wifi users. However, this is the second problem Google Wifi has encountered in a matter of months – back in February an error in the Google Accounts engine resulted in a hard reset across Wifi and OnHub routers that forced users to set up their devices from scratch again. That said, we had a very positive experience with Google Wifi when we reviewed it, finding it to be great value and extremely simple to set up and use. Google doesn’t have a permanent fix for this connection problem yet, or a date when users can expect one – we’ll update you with more information as it becomes available.